Edna numbers would be meaningless because of the strong head wind and most of the riders were sheltered. If you do the VAM calculations it would be really meaningless because it does not take into account these things! Full retard. Mind, it was a Vuelta stage, but the pace leading up to the timed segment was hard and the ascent pace above both jens' and ammattipyoraily's expectations. The figures show'n on tv are probably unfiltered instantenous power numbers, not climb averages. Anyway, I think the avgs will be very high too. meat puppet wrote: The figures show'n on tv are probably unfiltered instantenous power numbers, not climb averages. Anyway, I think the avgs will be very high too. Yeah but they showed them first when Amador just pace setting, and again when Quintana was riding his own tempo. Jens says this was the same as Froome psm, which is incredible really. I don't think Nairo has that much more room to improve until he reaches his peak. It means that effectively all the top 5 were doing 6w/kg or thereabouts. They are all in great shape. The Giro is still open I think. It makes you wonder about the watts for Dumoulin. If the numbers are right, either there was some sort of latent factor or the peloton is on jet fuel this year. Durden93 wrote: If the numbers are right, either there was some sort of latent factor or the peloton is on jet fuel this year. Well, it's hardly the only super performance so far. It's been a fast year. Quintanas time of 40:15 meas he would have done Alpe in 38:50 if we assume the same weather conditions. Make of it what you will. His performance was very similar to Alpe 2013 and he was very young at the Tour. Fair enough, but I'm not sure that results in a week long stage race are indicative of a racer form. Riders use them for different purposes. Escarabajo wrote: His performance was very similar to Alpe 2013 and he was very young at the Tour. He was, but he was climbing incredibly well in that last week on Alpe d' Huez (he was the strongest of the favourites) and obviously the stage he won to Semnoz, beating Froome and J-Rod with Contador 3 minutes down the mountain. Brullnux wrote: Jens says this was the same as Froome psm, which is incredible really. I don't think Nairo has that much more room to improve until he reaches his peak. It means that effectively all the top 5 were doing 6w/kg or thereabouts. They are all in great shape. The Giro is still open I think. Froome at PSM and Ax3 managed to put at least a minute into the next best rider though. In the end, it's the relative performance that counts, how much better you are than the others. I remain skeptical how useful it is to compare w/kg across climbs and races. If we teleport today's Quintana into the PSM stage, does he finish s.t with Froome? Perhaps. Teleport this Giro's Quintana into the 2015 Tour and I think he'll finish where he did back then at PSM. Or perhaps only 30 seconds down. He might have reached a new level this year. Vetooo (@ammattipyoraily) estimated 40min @ 6,2w/kg for quintana. Not very encouraging, though it was a one climb stage early on in a GT. 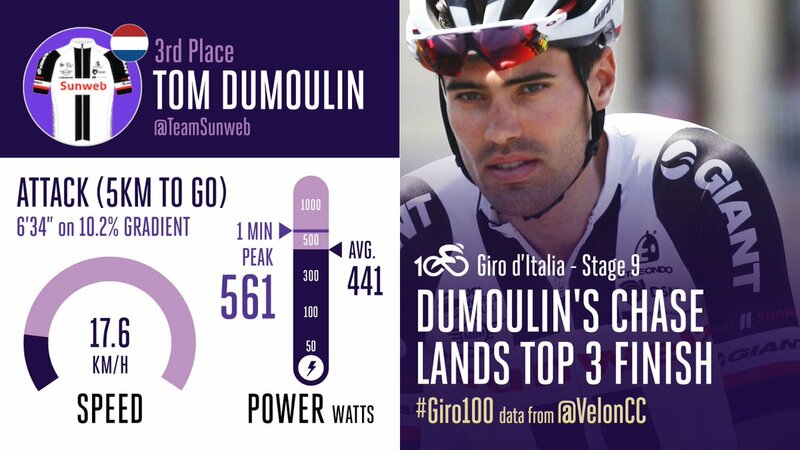 In pure power output Dumoulin is looking good for the TT. He looked really good on the bike. You could see that he was feeling good. Maybe he improved a little bit compared to his best moments of the past but not by much if we go with the data. 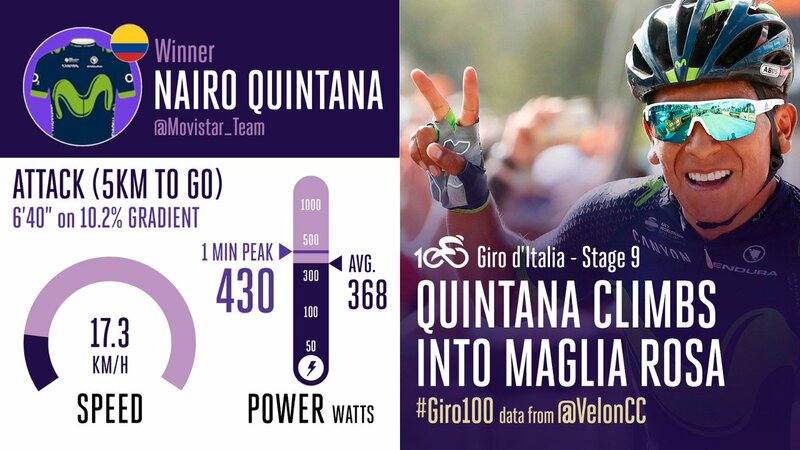 The difference with Quintana is not his power output in climbs like yesterday. The difference is that he can put that same power output (6-6.2 watts/kg) in the third week of racing. Is simple. very hard to do. Bavarianrider wrote: Quintanas time of 40:15 meas he would have done Alpe in 38:50 if we assume the same weather conditions. Make of it what you will. Anyway, very good performance. But power outputs have been through the roof all year long. I will make nothing of your comment because it is not supported with any backing for your claim.